Color your home with indoor plants that bloom also in the winter months. Among the cold season stars we can include Poinsettia, Azaleas, Cyclamen. For some time, African Violet is more and more appreciated by plant lovers. Outbrave the outside weather with a colorful and fragrant floral decor! 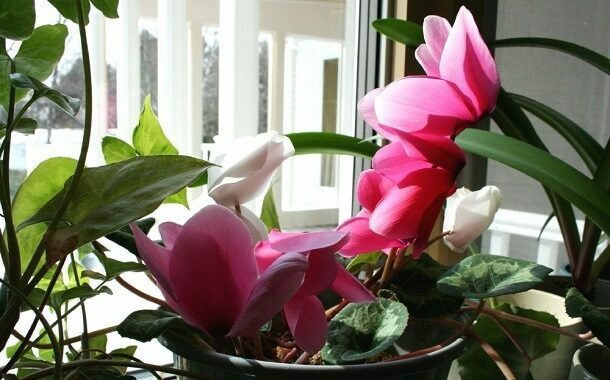 There are many species of indoor plants that bloom in winter, for example, Cyclamen is considered holidays’ messenger. Here are some prices and tips on how to take care and fully enjoy your potted winter plants. Azaleas is also known under the name „mountains’ rose”. You can buy it for $19,98 1gal to $89,98 7gal. One of the most beautiful plants that bloom in the cool seasons of the year, spring and winter, is Azaleas. This plant needs special care, being a pretentious plant, but when it blooms, its petals get colored in shades of the most enchanting nuances of pink, purple, white and red. Keep it in an area partially shady at temperatures of 22° C-25° C during the day and 16° C -18° C at night. When you wet it, the water shouldn’t be too cold, otherwise it will get yellow leaves. Did you know that for the Chinese Azaleas is the symbol of femininity? During the cold days, every house seems warmer and cheerful for guests, when there is a Poinsettia strategically placed. It is also called ” Do not disturb me” because once you change its place it won’t blossom that year its shoots will fall. It doesn’t stand powerful light and needs to be watered every five or six days. It also prefers temperatures below 14° C. If you want it to last in a room during winter, with temperatures between 20° C and 25° C, you should wet it every two days. Eventually, you could just put water in the plate pot. Another plant that makes flowers during winter is Cyclamen. Starting from September to March, Cyclamen blossoms several times, with petals in shades of white, purple and red. It prefers a cool place, with wet air and without too much light. If you change its place or you keep it in a cold current, the Cyclamen plant will lose its flowers and leaves. It needs well-drained and fertilizer soil, and it doesn’t stand excess of water. Put water in the plate pot and leave it ten minutes, then remove the excess. Pansies are very resistant to cold. Although they are small and fragile, pansies will cheer you up with their colorful flowers even in winter, because they are very resistant to cold and can survive freezing. They need light and love water. If you keep them in a pot, pansies should be protected against dry air, heat and darkness. They grow well when the soil is wetted and enriched with fertilizer. You can water pansies twice a week. African violet doesn’t stand to be touched. The beautiful African Violet is sensitive and needs special care. It needs to be watered twice a week, fertilized once a month and prefers moderate light and temperature. When you wet it, use water at the room’s temperature, but do not touch it, otherwise, it will stop blooming and it’s a shame to miss its cute pink, blue and purple flowers. It’s good to alternate the watering, meaning, you put the water in the pot then in the plate. You should know that any plant that grows slow costs more than the ones that grow fast. The price also depends on the size of the plant you want. Should the average working Jane get flowers that blossom in cold seasons? If you like flowers and want a more colorful home during winter and spring, then you should get one (if not more) flower that blooms during the cold seasons. These flowers aren’t a lot more expensive than the one you are probably used to owning, so getting such a plant won’t affect your budget too much. These types of flowers don’t need too much attention and will be a great way to bring your home to life and give it color. How Much Does a Tom Ford Perfume Cost? How Much Do Loving Cats Cost?